Whether you are a man or a woman, hair loss can be traumatic and reduce your self-esteem. Fortunately, there are extremely effective hair restoration techniques that can correct the problem of thinning hair. At Facial Plastic Surgery Associates in Houston, TX, facial plastic surgeons Dr. Russell Kridel and Dr. Angela Sturm utilize cutting-edge techniques for hair restoration (also known as a hair transplant or hair replacement surgery) that will produce natural results with very little discomfort or downtime. At Facial Plastic Surgery Associates, the follicular unit extraction (FUE) technique is performed with the state-of-the-art NeoGraft hair restoration system. Dr. Russell Kridel and Dr. Angela Sturm are proud to be the first to offer the NeoGraft technology in Texas Medical Center. Dr. Kridel has been performing hair restoration procedures for over 20 years and is recognized by his peers for his expertise and advanced techniques. Dr. Kridel has published scientific journal articles and text book chapters on hair restoration and has been recognized for his expertise and leading-edge techniques. Dr. Sturm learned about hair restoration from the best, completing her fellowship training with Dr. Kridel, as well as receiving additional specialized training on hair-restoration techniques. Both Dr. Kridel and Dr. Sturm are facial plastic surgeons who have extensive specialized training in the face, head, and neck, so hair-restoration candidates will be in the best of hands with either surgeon. For hair restoration surgery to be successful, the patient needs to have some areas of healthy hair growth that can be donated to thinning or bald areas. Patients who are almost or completely bald may not be candidates for a hair transplant, but may wish to schedule a consultation to talk about other options. Hair restoration is not just for men, at least 40 percent of women experience some hair loss due to hormonal changes, illness, or aging. Hair loss can be a very stressful experience for women since hair can be an expression of a woman's femininity, style, and personality. For many women, hair loss can feel like an isolating experience, but thirty million American women are affected by hair loss. You are not alone and there are options for treatment. NeoGraft hair transplants can be very effective in treating hair loss in women. For optimal hair growth, a hair transplant can be combined with nonsurgical hair restoration options, including NeoLTS and Hair Medica hair growth products. Hair restoration requires thoughtful consideration and planning. During your consultation with Dr. Kridel or Dr. Sturm, you will discuss your desired results and determine which techniques are the most appropriate to achieve your goal. They will evaluate your hair loss and assess its progression. Achieving a natural appearance in restoring hair is a challenging goal. This procedure can help you not only look better, but feel better too with increased confidence and self-assurance. Dr. Kridel or Dr. Sturm will talk to you during your consultation if you may need multiple sessions and realistic expectations. The follicular unit extraction (FUE) technique means the donor grafts are extracted one at a time in sections less than one millimeter in diameter. With the state-of-the-art NeoGraft FUE system, each graft is carefully removed from the back or side of the head then planted into tiny recipient sites with a pneumatic machine that protects each hair, leading to a higher “take rate” and thicker hair. While performing the FUE technique by hand can take a long time, the NeoGraft technology enables Dr. Kridel and Dr. Sturm to offer faster and more successful follicular unit extraction. Patients whose donor area is limited due to tightness of the scalp or those who tend to heal with wide scars are good FUE candidates. Dr. Kridel or Dr. Sturm will design the hairline direction, distribution, and pattern of hair growth for the most natural result. Surgeon skill is important because the hairline is essentially re-designed. Proper placement, depth, and angle need to be considered to achieve a natural pattern for future hair growth and requires an artistic eye combined with surgical precision. Because there is not a removal of a strip of hair from the back of the head, there will not be a linear donor site scar and the recovery will be faster with minimal discomfort. Typically, these tiny extraction sites heal so that no one can even tell you have had it done. This technique is excellent for any patient who does not want a scar or may want to shave their hair in the future. With follicular unit transplantation (FUT), a large number of follicles are harvested in strips. The strip of scalp is removed and then microscopically dissected into follicular unit. There will be a small scar where the strip was harvested, if you decide to shave your head. The FUT technique is a great choice for many patients, especially women and men who prefer more coverage over the option of having shorter hair. The advantage of FUT is the large number of grafts that can be taken and transplanted from an area, since nearly all of the follicular units can be used from the strip. Therefore, a great deal can be done at one time. Facial hair restoration techniques involve the removal of donor hair, microscopic dissection, and recipient site preparation and placement. Depending on the individual patient, FUT or FUE with NeoGraft techniques are effective to create a full beard or to fill in thin areas of the beard for more complete coverage. This same technique can be used to create sideburns in patients that want more coverage, as well as patients who want to hide facelift or burn scars. Many women and men have thin or undefined eyebrows from excessive tweezing, hormones, thyroid disease, genetic hair loss, natural aging, and other reasons. Eyebrows frame the eyes and can give a more youthful look to the entire face, which makes the loss of eyebrows very distressing. To counter the aging effect of thin eyebrows, many people try drawing them in with pencils, gels, or eyebrow tattoos. These can create the illusion of fullness, but do not re-create the eyebrows. With eyebrow restoration, men and women can have a permanent, natural-looking eyebrows from their own hair. Eyebrow restoration begins with hair that is harvested from the back of the scalp with the NeoGraft system. Unlike other hair restorations, the follicular units are separated into single hairs and artfully, delicately placed into the exact shape, fullness, and direction that is best for your face. Since the brows are created with your own hair, the appearance is very natural and the procedure is virtually undetectable. All hair transplant surgeries are performed in our AAAHC-accredited, in-office surgical facility. The entire procedure can take up to 3 – 8 hours to complete depending on the number of grafts that are required with oral medication and local anesthesia used to minimize patient pain and discomfort. Recovery varies in each patient based on the extent of their surgery, although the NeoGraft technology allows a faster and more comfortable recovery than previous hair surgery methods. Some people can go back to most activities the next day, but most patients wait 1 – 2 days. Everyday activities can be resumed in 1 – 2 weeks, but exercise and strenuous activity should be avoided for 3 – 4 weeks. The cost of hair restoration surgery can vary depending on the technique, area of coverage chosen, as well as the causes of the patient’s hair loss. It is traditionally priced per graft and will be discussed during the patient's consultation. No. Once the scalp is anesthetized the procedure is painless. When sedation is used, you will lose track of the 3 - 7 hours it usually takes for the procedure. You can wash your hair very gently two days after surgery with water and baby shampoo. On the fifth day, you can resume your normal hairstyling methods. 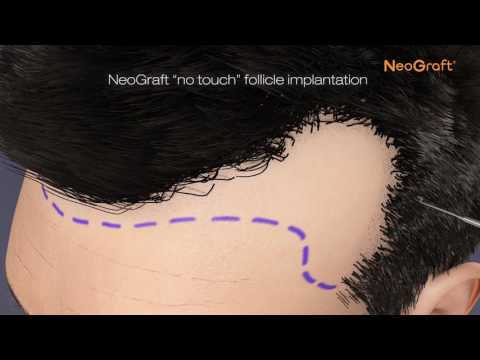 The Neograft FUE technique does not use stitches or staples. If you have the FUT technique, the stitches or staples used to close the donor area in the back of your head will be removed in about 10 days. The NeoGraft technicians at Facial Plastic Surgery Associates have extensive hair transplant experience. It takes an experienced team to efficiently perform the labor-intensive task of harvesting the donor hair, dividing the donor hair into hundreds or thousands of follicular units under microscopes, and then inserting each of them individually into precisely cut slits. Dr. Kridel and Dr. Sturm design the recipient area, hair direction, and placement, but to get the transplant completed in a reasonable time frame, highly trained technicians are needed to simultaneously create and place the thousands of follicular units. What is the Typical Result? Dr. Kridel and Dr. Sturm will create a very natural looking appearance that makes it hard to distinguish from the full density you once had before genetic hair loss or trauma occurred. Since we are taking hair from one area and placing it in another, we are not technically adding any additional hair, but it will look fuller and thicker.